After a disturbance within ley-line balance (can be due to primordius or not), a very old beacon restarted emitting a signal, a very old energetic one coming from the north-west of Tyria. 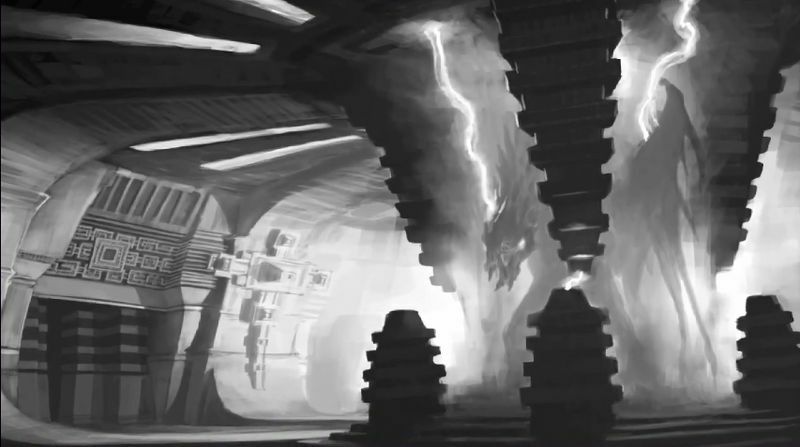 Several organizations started to track down the signal, permit them: Asuran colleges, the Priory, the Inquest, the Pact and the Vigil. 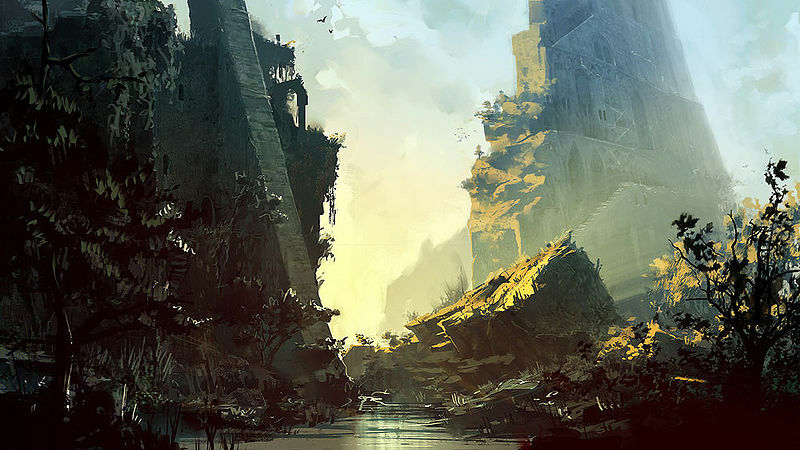 A giant wall, previously preventing explorers to travel at the north of Harathi Hinterlands got destroyed by an intense volcanic activity; allowing everyone to explore a part of woodland cascades and north of Maguuma Wastes. Maps+ their events+ quests+ legendary cultural armor idea+ mini-raids idea are made by me, also first sketch of Quora Sum architecture too, others are concept art by Anet, since I drew several of loading screens, but looked almost the same as the Anet ones globally, so decided to use them. A giant scar passes through the entire valley letting erupting some lava. An original giant wall was present at the south of the map, but it is now destroyed. The map is mostly occupied by centaurs, apart the north which has small pouches of asuran resistance: Inquest Pyronix lab is studying destroyers and fluctuation of ley energies at the center of the lava lake. 2 Older laboratories are also present near it, with old technologies studied by colleges and inquest in same time peacefully. 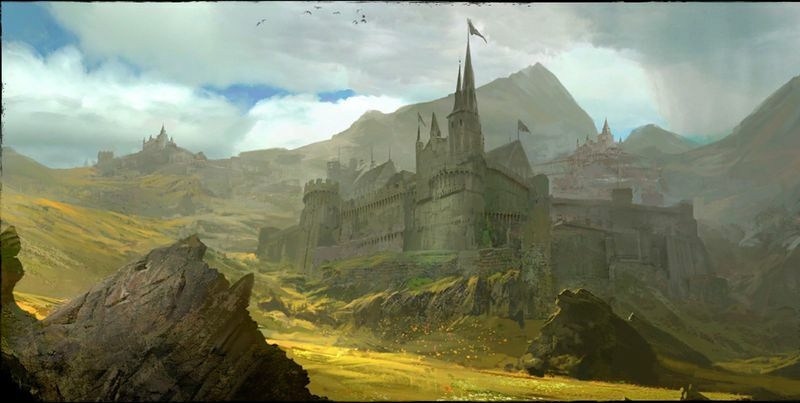 At the north-est, shown on the loading screen, a very old castle from an unknown origin, now occupied by some asuras which turned it into a market place. They also added an asuran gate leading to Aethervolt lab in brisban wildlands. (require a story step/quest to fix the gate and unlocking it). 1. "Help centaurs to find sources of food" -Since every cultures and stocks was based within the great wall, several centaurs are now in the need. 2. "Defend the trading-place against skritts" -Asuras and centaurs trading baubles? Skritt wants a shiny too! 4. "Oversee research in ancient laboratories" -Check if no one are spying each others, help each organization to find artifacts. A very foggy forest with an alpine/temperate scenary with several huge pines and other species. Along several asuran ruins you can find a very strange altar at the middle of the map, surely Jotun origin. Three stones linked to a rune, probably an inter dimensional portal allowing great beasts to appear including imps, shadows.... Seraphs have a camp at the north-east, overseeing the frontier behind that map and fractured valley. Canopy of the spirits is considered as very dangerous: Lost spirits can be found telling the horrible reason of their death. Sneaky bandits assassin are present around all the forest too. The northern asuran fortress is used as a shelter and lead to a consequent underground part: An ancient asuran library, but it's occupied by several graveling and spiders. Hopefully the pact and the priory are there to secure the place as much as they can. 1. "Help seraphs securing the road" -Prevent bad things from happening between the asuran fortress and the entrance to Fractured Valley. 2. "Assist the priory for their research within the asuran fortress" -Protect arcanists, researchers and troops against any danger. 3. "Hunt with the local hyleks" -Around the delta at the north-west. Catch fishes, kill some minotaurs and deers even fireflies. 4. "Allow ghosts to find peace" -Ask ghosts and walk with them around the forest to understand the origin of the torment. Half rocky mountains, half alpine forest, that's your map! The picture shows the entrance of Quora Sum, so the rocky part. A huge chain of mountains separate the two main environments. Inhabited by essentially skritts within tunnels, and on them, zephyrites. In the coastal jungle area, a quaggan village. At the other side, many floating islets, and two giant watch-towers. 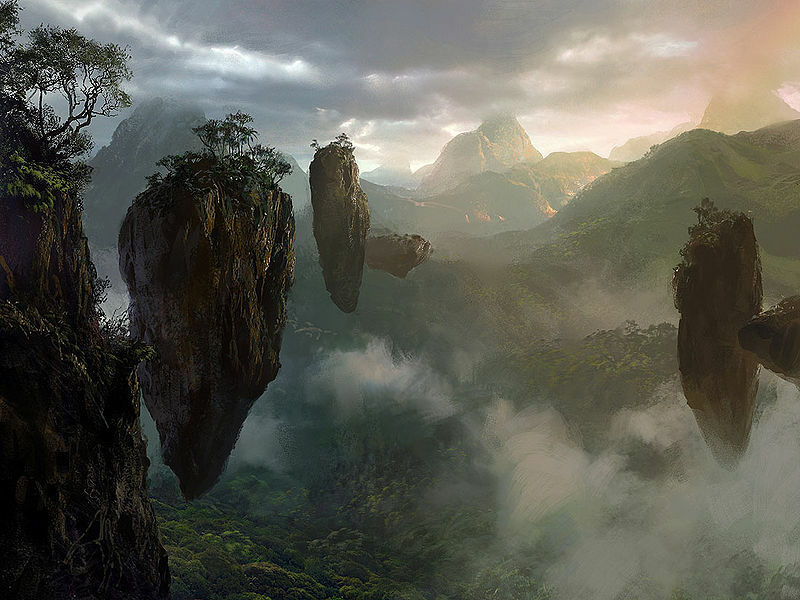 Mesa-like, with Savannah-typed creatures, very arid with only few very rare pouches of water. Some old golem exo-skeleton can be found, lying destroyed, inactive. 1. "Help quaggans fishing" -Catch some fishes, light on lanterns, hunt down sharks. 4. "Help zephyrites farming on floating islets" -Use bridges between floating islet and help them growing several kind of plants, avoiding larvae. Completely underground map. The old asuran capital of Quora Sum, a volcanic activity fractured the city in three main districts which are still intact. At the east, the educational district with training grounds and the main laboratories complex Upsilon. At the center, the vital district with the Data Center, the Power Plant and the water station. At the west finally, the demos district with the giant University which was used to welcome Dynamic, Static, Synergistic and Inquest all part of the same institution books are here engraved crystal panes linked between them with a stone ring sometimes data are engraved on crystal in data center; and the greenhouse to study plants and how they react to several sources of light. With two observation platforms allowing asuras to have a beautiful view on the south-western lake. Note that we can find one watch-tower per district, that's why like rata novus, the city has been evacuated really fast. But a fail-safe system got the time to activate himself preventing any damage to the city: Force fields. 1. 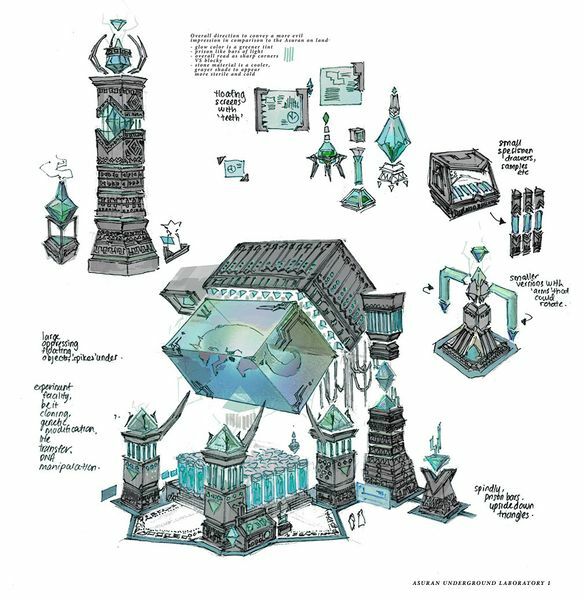 "Help everyone gathering knowledge within the Data Center" -Gather some cyan fluorite data crystals, check the system on asuran consoles. 2. 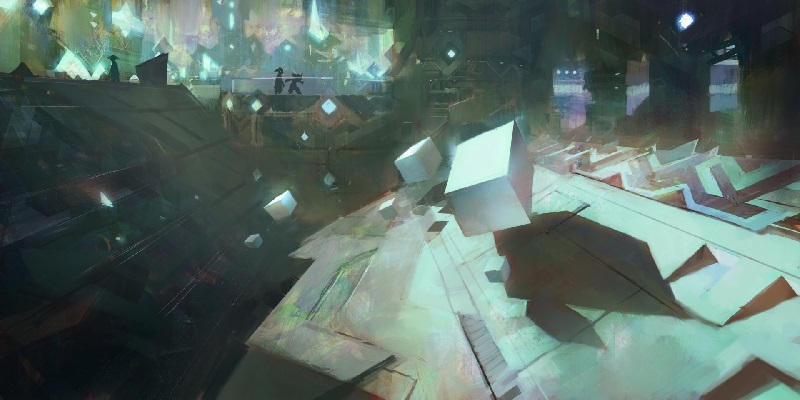 "Assure power supplies for the city" -Repair broken cables, bring fluorite crystals to the core, kill any destroyers attracted by crystal lights. 3. "Check on the labs complex security breaches" -Contain destroyers specimens and animals within their cells, control air filters and avoid contamination. 4. "Prevent destroyers invading the western district" -Already invaded the greenhouse, stop them before they capture the university! Again, a full underground volcanic map, with lava falls at several corners. 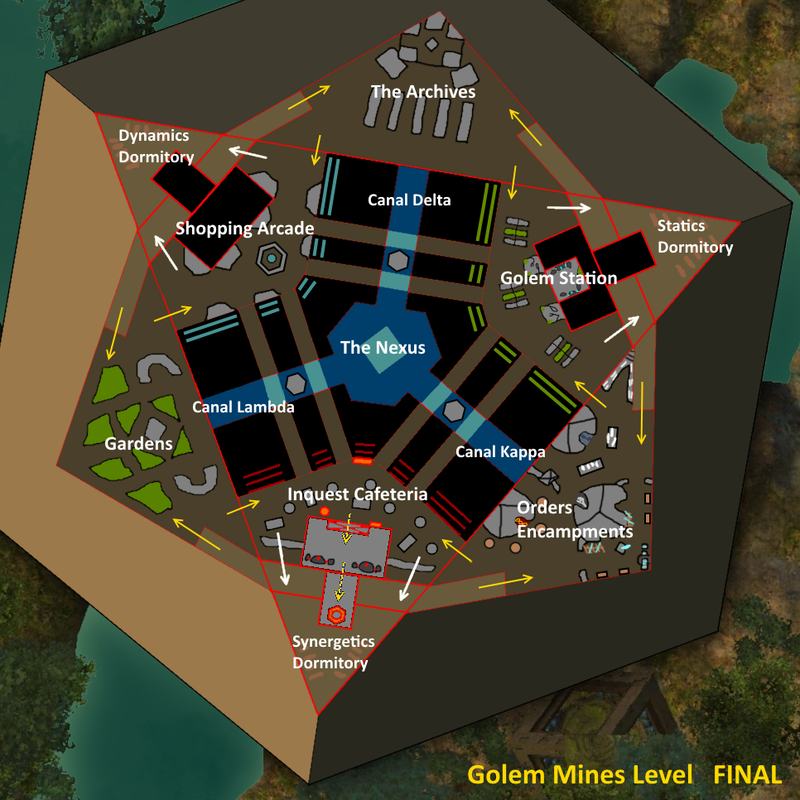 That map is a kind of extension for Quora Sum and welcome 2 main structures: The golem factory at the south-west and the Amphitheater at the middle, that second building was used to showcase the latest technologies to civilians under a giant icosahedric fluorite dome which is now broken due to volcanism. 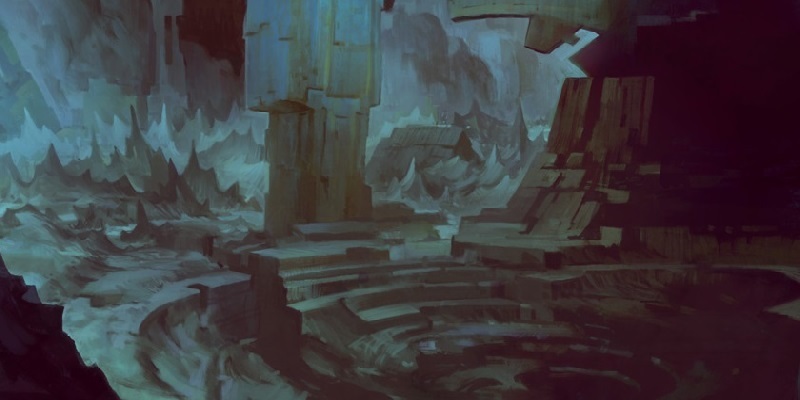 A great part of the map sank into lava, was previously a crystal quarry (of course, golems are powered by those crystals) and was welcoming the Asuran Gates Hub. The factory works with geothermic energy but without crystals it's useless. Can welcome primordius fight at the middle if needed. 1. "Assure crystals supply." -Defend the soldiers bringing crystals to the factory from destroyers and skelks. 2. "Help researchers within the amphitheater." -Find artifact and classify them, defend researchers. 3. "Maintain security around the lava lake" -Repair ancient asuran electro-magnetic cannons, kill destroyer wyverns menacing miners. 4. "Collect rock samples for scientists." -Gather rocks ejected by the lava. Fast sketches from me concerning the overall look, some architectures. Explanations: Three main entrances, two for great minds: can be a council member or highly respected inventor sometimes, citizens. The last one is for inventions themselves like golems or whatever, brought to the center of the amphitheater. It works like a tribunal, one asura is for the invention, another against, all the public vote after the speechs for or against. The two main contestants take place on the two floating hexagonal islets under the dome to have a global view. Someone come at the middle with the invention as a judge. Also outside of showcases it can be used by anyone even as a classroom. Rata novus is NOTHING, here we will discover a very technologically advanced city, better than Rata Sum or Rata Primus themselves, but that knowledge was lost with ages, it's now time to discover it again! Asuras can become more than great again. Asuran gate leading to Polymock Arenas is now activated ( even if the game isn't available, it's for the sake of the eternal alchemy and that poor worker). Gorr lab is accessible outside of story, his asuran gate is now functional. Port authority Inquest stone portal is open, it was in fact, Inquest Dormitory. Moto's secret lab is always accessible. 2-By using the hexagonal elevators present near holographic bridges at "Substrata" layer, moving downward too, allowing access to the last level. Shopping Arcade: Several Bars and game tables for asuras. Not rare to meet some drunk norns or humans there. Also a good surprise: The Holo-Krewe news have a kiosk at the center. Golem Station: Here malfunctioning golems are repaired, but some new golems can be built too. Several dismantling tables, circular saws, golem pieces... And golem acting very strangely. Inquest Cafeteria: Kinda like the arcade, at the back some Inquest chiefs and bartenders preparing drinks and meals. Here agents are enjoying conversations and good food. Easter egg: Within Inquest Cafeteria, you can find an Asuran Stone Portal locked with near it a PA announcer and a control panel. The door is protected by a password. Which one you can obtain by making Inquest agents drunk: You need to find 8 agents, each one giving a character between hiccups. Then rearrange them to find the code. Once unlocking the door, you can access the Inquest private elevator leading you to "Auxiliary study room" where Inquest are doing some experiment. -If you don't have the item, it trigger an alarm, two golems are running at you, immobilizing you and sending you outside in front of the force fields near recruiters. -Engineer: Shortbow (crossbow if possible) to shoot modified arrows and flasks. Turn F1-F5 from tool belt into real skill usable with any weapon. Ability to destabilize the reality, and summoning watchwork golem name: Mechanist. Cyan fluorite are used as golem power core and to enhance arrows/bow. -Warrior: Pistol very fast pistol allowing to blind and cripple the enemy for a considerable time, skill 5 can blowout, name: Infiltrator. -Elementalist: Longbow ability to attune bullets with one of the four elements, each element is strong and have a special effect for third skill (heal/protection/fury/power), name: Destroyer. Based on the fact that asuran cyan fluorite crystal can channel elemental energies through them like engineer. -Necromant: Sword, uses toxins on weapons and also self-injecting them. Applying almost any condition to the foe. When used on self you gain several boons and conditions. The more you have, the stronger you are. Those asuras experimented on themselves making their bodies more resistant. Inspire yourself from the most strategic asurans ever known, learning how to support your allies. With the help of the most advanced asuran technologies, you can pass from a reality to another, but the link is vert unstable. The art of discretion and lethality, use smoke bombs, burn your weapons to deal increased damages trap enemies with their own strength. Use your shield like real golemancer, containing the energy and transferring it for any of your purposes! -Mesmer: Rifle shooting illusion bullets powered by psychic power, can be used to enhance weapons beware of the psychic power bar, name: Psyker. Psychic resonance with asuran crystals again to improve the power. -Servitors were used a lot, it wasn't rare to see a swarm of those following a golemancer or a rich asura, carrying stuffs, drinks or food on their head. -Only Diggers were sent to fluorite quarries, asuras never mine themselves. Carriers can also come if the rocks are too big to be destroyed efficiently. -Guardians are posted at every entrance points of the city, and also guard the Data Center. Those are very powerful, can shoot laser beams/ break necks, spines with their hands. More intelligent than other golems, they are equipped with a basic AI, and stored in them the appearance of an asura. Everything else is considered as an hostile unknown life-form. -Sentries are patrolling with peacemakers around every corners of the city, assuring the security and helping when they can, ability to shoot lasers with its arms, blind with head crystals. 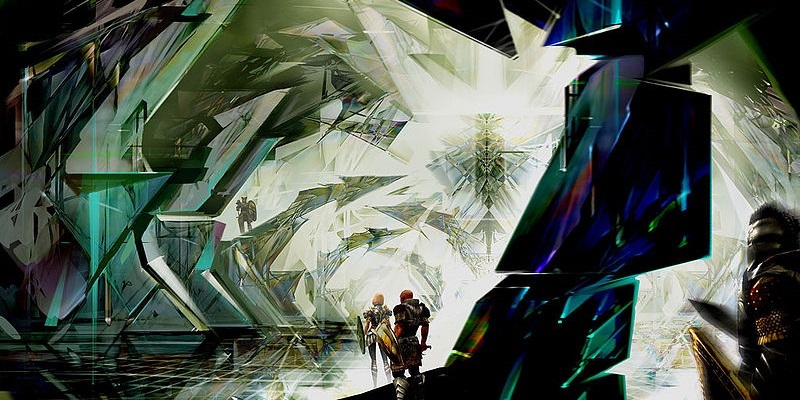 -Lights can emit light through its three side crystals, they are only used during exploration with most of the time the simultaneous use of Sentries, rarely guardians and carriers (only if they are sure of a potential lethal danger). -Ability to use skimmer underwater if possible, to make it useful. -Battle on lion's arch fractal. -Raid wing: Centaur Stronghold, surely at the south-west of Fractured Valley. -Turrets deployed by engineer are now asuran turrets if the chosen race is Asura. Mini-raids: As long as lair of the snowmen, giving the ability to everyone to explore unique little piece of lore/adventure within the new maps: 10 players squad. MR1="Ardent crucible" Exploring deeper and deeper the foundation of the castle "Fractured Valley map", spiral staircases and huge cathedral style broken rooms, at the beginning, foes are easy: some graveling, ghosts and shadows then some basic destroyers crabs, trolls types and at the end a giant destroyer wyvern. MR2="Abandoned dredge facility" A very fast empty forge with some remaining dredges and destroyers within. "Canopy of the spirits" Dredges used to retreat in the last vault where their leader within a giant mining suit try to beat a giant destroyer. Some little mechanisms are still functional like steam valves, water tanks. MR3="Skritts defense" Same map as "Enchanted Cliffs", you have to defend the tunnels against 25 waves of destroyers from at the beginning crabs to 3 legendary wyvern at the end. You can order skritts to use some asuran technologies or traps to help you. 3 players per legendary with 1 at the middle ordering to skritts what to do. A long asuran walkway with gardens, floating cubes and holographic plants. 2 Main water canals along it, at the exterior some crops and asuran ruins. Inside, a fluorite/quartz quarry, several asuran labs and houses. An event would occurs at a specific hour each day in guild hall where destroyers try to take it back. Where you can use weapons decos you put around your hall (rata novus turrets, pact lightning cannon, even WvW siege weapons which would be now usable). If players don't defend it, it reset the day after removing foes. But if you defend, you have rewards. Legendary PvE cultural armors: Completing any event within the four maps award "unknown artifact shard" (10) and 30 if finishing a Meta, you can also do SUMR to earn more shards (see the next paragraph). ->Ascended cultural armor schematic + 1000 Unknown artifact shards + 125 ectoplasms + 15 Mystic clovers = Gift of Ascended cultural armor. ->2 corresponding ascended armor parts (made with Bolt of Damask/Elonian Leather) + Gift of Ascended cultural armor + 5 Racial trophies = Your Ascended cultural Armor Piece. 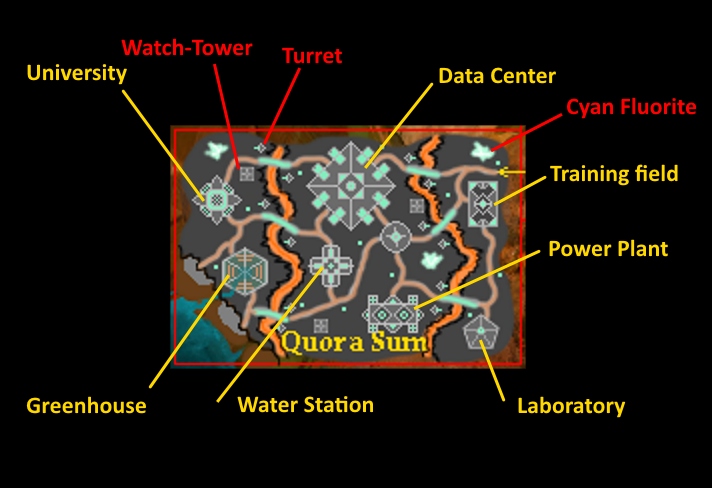 SUMR="Deeper labs complex" Within "Quora Sum", an hexagonal platform moving downward but stopping at every floor due to containment breaches. 17 floors. With each 7 waves of enemies: So 119 waves, with a 120th one with the stronger foe. 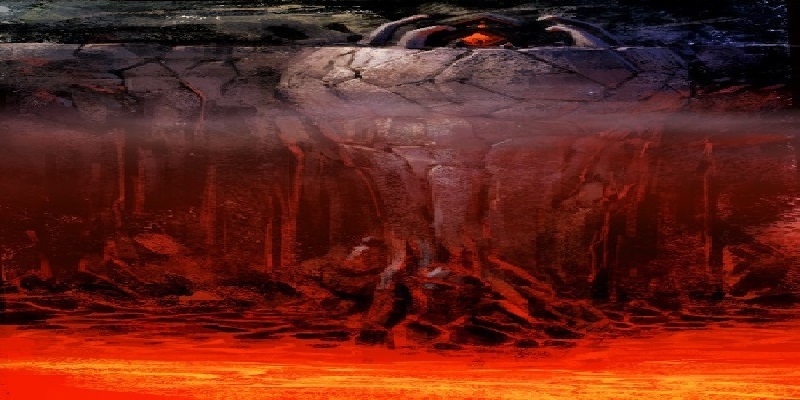 Would start with some haywire golems, gravelings or chaks and then some big trolls or destroyers, then big wyverns, giant, huge security golem, destroyer giant, destroyer cerberus, destroyer scorpion to end with a reinforced destroyer (probably an experiment) A giant destroyer-like humanoid wearing powered armor shooting lasers... whatever. The difficulty level at the start is low then it increases, that challenge stop when everyone is dead, everyone is rezzed after finishing a wave. The higher wave number you are better the reward is, level 120 is achievable but after learning how foes works. Last wave of each floor is a boss champion, apart last, legendary. 2 First floors award both 5 "unknown artifact shard", then two next award five more shards etc.... So Floor 17 = 45 shards. +Bonus if finished= +55 shards. Note: 17 floors can be only one, no need to modeling: Animated texture going up then stop, then repeat. But maybe possible? CF: Proxemics lab brisban wildland puzzle, animals room. The last wave. The legendary boss. Level 90. 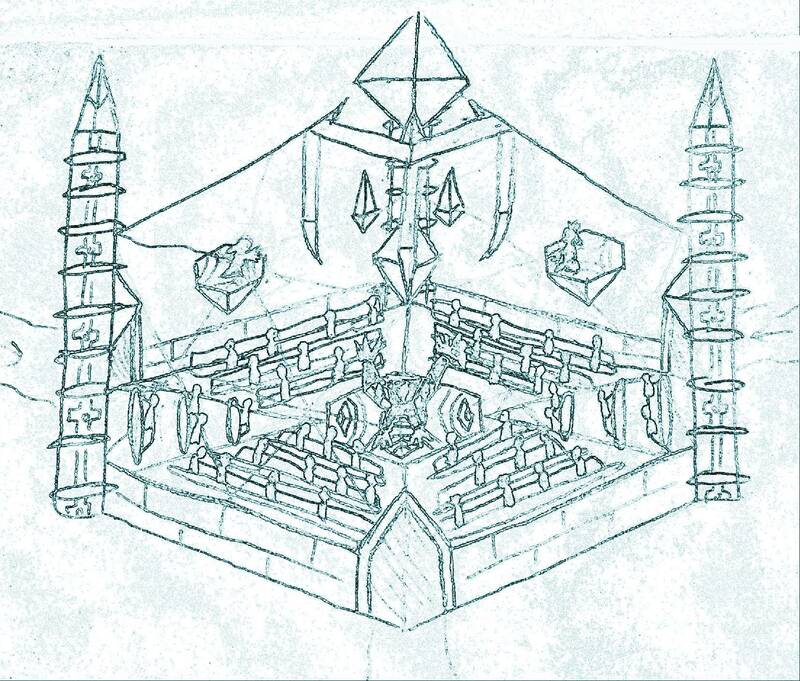 "Canopy of the spirits" = Spirits madness, the jotun altar at the center activate itself and release several demons, all spirits turn angry and the fog become thicker, several foes are assaulting the asuran fortress, seraph camp and hylek village. All need to be defended, the priory start from the fortress and travel to the center to fix the portal. Anything will try to kill priory before reaching center. 2 Phases: Peaceful forest / Destabilized forest. "Quora Sum" = The Blackout, the energy storage start to decrease dangerously, and all the systems are shut down: Several specimens escape from the laboratories, water tanks start to leak, destroyers are invading wanting to destroy the power plant. All the secondary power sources are directed to asuran turrets and defenses. 2 Main phases based on day/night cycle: During the day the energy build up with the help of crystals within the ceiling transmitting light to stocking crystal. Players can help by collecting cyan fluorite crystals, and helping every quests even if completed. For the night, several dysfunctions appear due to the lack of understanding from some ancient technologies and destroyer attacks. That's it! Note that I only developed 4 quests per map, in reality it will be between 8-14 if extension type map, I just gave some main ideas. I done a detailed map for each new area, but some little things are missing: Of course you have asuran houses within Quora Sum and not only main building, It's an overview and I'm pretty pleased and proud of it. I'm happy to have shared my idea here, got it since the beginning (6 years ago and never found the best moment to post it. ) and so that's it, will have zero regrets now. Several points can be detailed more, please be serious, when posting a feedback, indicate the point or at least the concerned part. 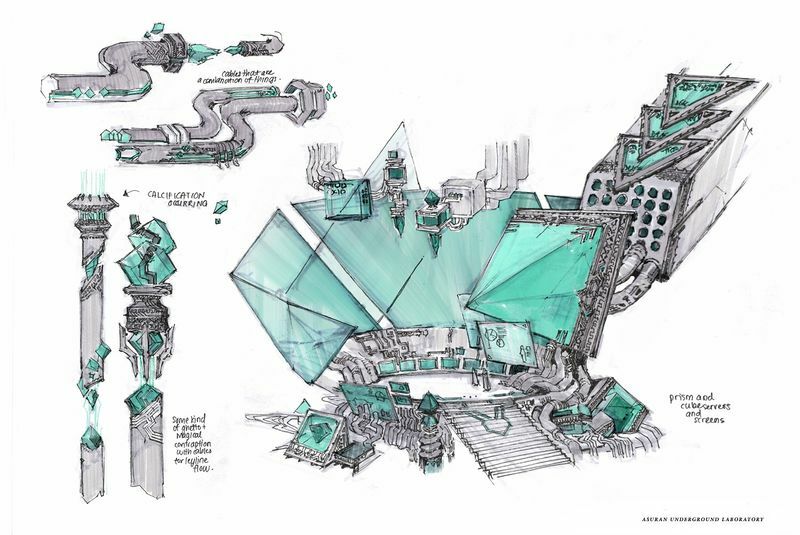 I really think that an asuran extension could be awesome, with all those fluorescent green machines and architectures. The maps have various environment and they are unbelievable, can surpass core level maps! Quora Sum can attract players and give them the envy to love asuras. I think you mean 'expansion', rather than 'extension'. Had to get to the bottom of the post before it became clear. Oh wow, I really like that! Though I'm a big fan of exploring more North, I think you did a great job here. I haven't even thought for a second we might go to the Woodland Cascades although it's so unexplored, and yet so close. I don't really play Asura but I get why people would want to see them in action as they were a bit left over by ANet when Rata Novus and Primus (and the Inquest base) got introduced. This thing is a whole expansion-worth content. I also love the fact that there would be some mobs we see in Core Tyria, they seem to have disappeared in HoT and PoF. This would be awesome if it was truly woodland. Not like a jungle but an actual forest with huge asuran architecture! We could even consider some of the Mursaat lore and stuff while being so close to Janthir's Bay. I could see Revenant getting GS but I guess we won't (I'm also not a big fan of GS for Rev), because we can see how ANet designs ESpecs. They try to not give the classes (of same armor type) access to the same weapon. 2/3 Heavy have GS, 2/3 Light have GS, 2/3 Medium have Shortbows, 2/3 Light have Swords, 2/3 Heavy have Staves, 2/3 Light have daggers, 2/3 Medium have Daggers, etc. Overall, I love the concept and I'm really looking forward to some Dev responses here. I'm curious what they think about it. Nice job! First: Fantastic work. A lot of love and effort clearly went into the OP. Kudos to you. Even so, I am sorry to say that I am not fond of the suggestion because of my dislike for the asura. I'd rather see an Asura-themed expansion than a Charr-themed one so I really like this. +EDIT: Added guild hall on map, plus description. i don't get why ppl always include especs in these xpac suggestion threads but clearly have very little interest in them. I agree, I just put them because it's considered as a basic thing to have, an usual thing. And just because it give some aditionnal skills and a new weapon. It's not the main feature. I'm not good at especs btw, would be better if I can find something related to asuras for all of them. I would like to see some truly Asura-themed elite specialisations btw. Even engineers are more about Charr technlogy(except Elonian-sun-related Holo maybe). Lot of time and effort, not to mention imagination, put into this. Great work! 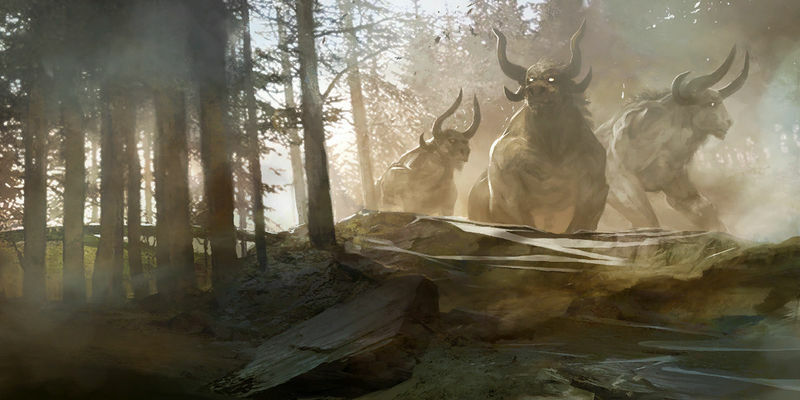 Also, I'd totally be down with an Asuran themed expansion. I also really like the idea of mini raids, would be great to have that! Great job! I would buy this expansion if ANet goes in this direction. One small suggestion - as an Asura Engineer, could we please get an updated set of kit/turret skins as part of this? The current ones are just so crude looking for a race that is so technologically advanced. Agree should be done, added in "Additions". Thanks. 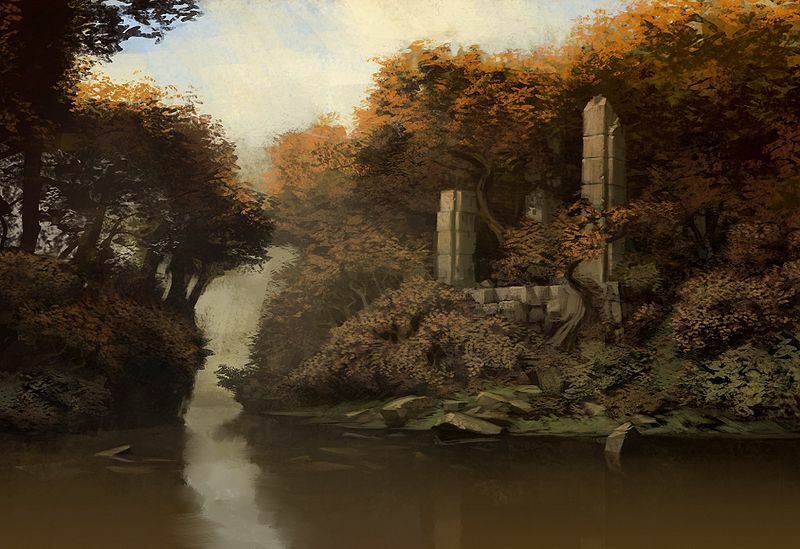 +EDIT2 for others: Working on the fifth map, would be called "Ardent Falls", north-west of "Quora Sum", description and loading screen updated soon. Golbal world map updated. Lots of great ideas and incredible art. I love the idea of more zones that have alpine mountains similar to what is in Bitterfrost Frontier (but perhaps with not so much snow). I would propose swapping the elites for Mesmer and Elementalist in regards to the weapons. Mesmers already can use pistols, so the idea that they would potentially upgrade to a rifle flows well, just as the elementalist, classically shunning "technology" would flow more into the longbow scenario. Either way though, the suggestions are great. Wow! As an asura main, I really love this! And hopefully there'd be no Inquest. No bet on that haha, will be there but as allies, they have no reasons to be annoying, just want their little piece of knowledge like everyone. I want an expansion where even Inquest are pacifist, they only own Pyronix lab in Fractured Valley, where they welcome peacefully other colleges here showing their progress about destroyers. 3 last maps were owned by Quorans. 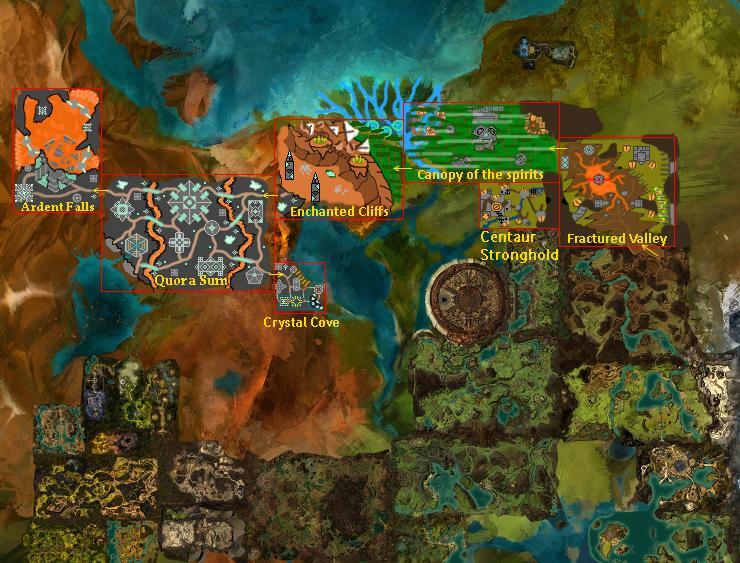 -Changed global map, added zephyrites, quaggans, hyleks, centaurs farming fields. -Added Golem designs just before "Additions". -Finished Ardent Falls map, added details about the asuran "Amphitheater". Concept now finished. Thanks for all the positive feedback! You're all awesome. Hope @Gaile Gray.6029 or any dev will see my Idea, if not it's okay too! Was happy to share my idea. Will just add centaur stronghold raid to the map once I done it! You got a thumb up for your effort but this isn't exactly my thing. I'm more of a Cantha-guy. i think something you could try is to see especs as a way to tell more about your new area and it's unique challenges or benefits to the the peeps living there. asura necromancer might have trouble finding volunteers for their experiments so they might try using themselves as guinea pigs resulting in alot of "the fly"-type incidents and that's why the new espec has a body-horror theme. Lots of great effort from you, and i applaud that. Thx @derd.6413 , very helpful, awesome ideas will try that. @Ayakaru.6583 yeah I know. I just wanted an asuran expansion, and maybe like Utopia it will never see the sunlight. 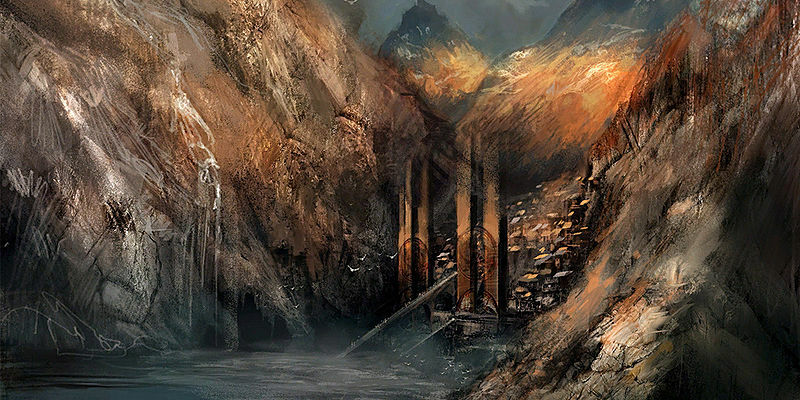 It's a great lore/exploration and we should have at least those kind of maps. The future is uncertain, how long will it last? Ls4e6 then Ls5e1-2-3 then abandonned? I have no ideas. My greatest mistake was waiting before posting my concept. Should have posted it in 2013 when all teams were there. Note I'm not ignoring other idea, Cantha would be great, but just like the district in DR it will be nuked. Norns, why not with kodans? Charrs, same flame legion, homelands? I just added Centaur Stronghold Raid to the map. Completed the concept with another idea: Added a new floor to Rata Sum: Golem mines layer, those golems were mining for 6 years now, it's time to end the suffering. Also Unlocked access to Polymock Arenas and Dormitories both were locked since the launch of the game, time to add them. Due to my expansion suggestion increasing scale, I will create a Wiki User-Page associated to it. Stay tuned. Link added at the top once it's done. I see you trief to aply my advise on especs but i think you missed the mark by a wide shot. Some don't even make sense. I mean, the necro spec comes from studying assasination techniques from the inquest? I have to say I am impressed by the sheer amount of work you put in, but I'm not going to read through all of it because I want less Asura in this game, not more. So for me this is barking up the wrong tree if you will. Yeah yeah it's not perfect, will edit it. Will remove especs part, I'm not great at it at all, and I never liked them anyway, I'm mostly focused on exploration/lore. I also am more of a lore guy. If you want i can try to coff up some basic espec concepts if you want. Yeah, I found an idea for necro I think. Yup, thanks @derd.6413 for your very helful suggestion, liked the self-experimentation for necro, but don't see at all the skills even the weapon. Took inquest as a basic thing but I concede It was no-sense. Mmh, maybe alchemist, even if it sound like an engie one: Using several toxins associated with the weapon/ self injected, giving boons and condis to the player. Alchemy is engi so i wouldn't recommend it. If you want an idea for selfexperimentation type characters i'd say dr mundo from lol is a decent example.